Have a weekend project or just want to handle the cleanup yourself? With our trailer service, you can keep the trailer for up to two days for the same price. We drop it off and pick it up, and you only pay for the amount of junk you put in it. 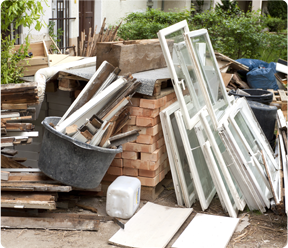 We aren't just a junk removal company - we are also Windsor-Essex's Demolition and Disposal Experts! We give you an upfront price that includes labour, removal, and disposal for your entire demolition project, and can demolish, remove, and dispose of debris from decks, garages, sheds, fences, interior walls and rooms, kitchens, and more.